In times where moms give their sons and daughters DJ-courses for their birthdays and bootlegging has become an Olympic sport, it is nice to see a record that sets a new standard in the genre of mix-albums: ‘2 Many DJ’s’ from Belgian groove-gurus Soulwax. Fans of quality left-of-centre rock music will know Soulwax from their highly acclaimed album ‘Much Against Everyone’s Advice’, which made it into the British Top 40 and got rave responses in Japan and Australia. But there’s much more to the two brothers than meets the eye. Apart from being chairman of the Belgian Carpenters Association (Stephen) and having a black belt in tae kwon do (David), they are also masters in blending the finest products of music history together into a catchy, hilarious and -above all- intriguing groove exploration. From politically incorrect prog-rock to funky r&b, from trendy hiptrop to banging German techno, ja: if it gets a booty going, the Dewaele brothers have it in their record collection. 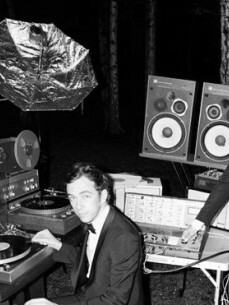 Blending beautiful tunes is far from new for the Soulwax brothers. Back in the dark days of 1999, David and Stephen started a DJ-show on Belgian national radio, called ‘Hang The DJ’, where they did exactly that. Years before bootlegging reached the trendy pages of The Face, they were already making their own mixes for inclusion on the show. Inspired by the philosophy of one Grandmaster Flash, they cut together the best bits of funky tracks into an even funkier mix. It was then that classic mixes of Blackstreet with Grandmaster Flash, Beck with Prodigy and Beastie Boys vs. Herbie Hancock with INXS vs. AC/DC saw the light of day. Praise the Lord. After having wooed Belgian and Dutch crowds for a few years with these eclectic sets, they went on to impress the most cynical part of the world, the London scene, a loud yet harmless species. The British capital, where approximately 67% of the population (including 17% of women over 65) owns two decks and a mixer, is used to a thing or two, but Stephen and David immediately raised quite a few eyebrows with sparkling sets for London’s independent radio station Xfm, national institution BBC Radio 1 and appearances at the renowned Trash nights in London and Arthur Baker’s Sunday Sessions in The Elbow Room. No surprise then that ‘2 Many DJ’s’ has been in the pipeline for yonks, but because getting tracks cleared is a legal war zone, it has taken quite a bit longer. “Mick Jones from The Clash was very impressed with our bootleg version of their ‘The Magnificent Seven’ mixed with Basement Jaxx’s ‘Romeo’”, explains Stephen, “but still we didn’t manage to secure the rights to include it on the album”. Rumours that two lawyers have been decapitated since are unconfirmed. Too bad, but there’s more than enough magic material to keep you intrigued, smiling and shaking. The record includes already renowned mixes like Destiny’s Child’s ‘Independent Women’ with 10CC’s ‘Dreadlock Holiday’ and Stooges’ ‘No Fun’ with Salt ‘N’ Pepa’s ‘Push It’, but it also features new beautiful blends like Röyksopp’s ‘Eple’ with Dolly Parton’s ‘Nine To Five’ and Basement Jaxx’s ‘Where’s Your Head At’ with Emerson Lake & Palmer’s ‘Theme From Peter Gun’. Tongue-in-cheek is the first thing that springs to mind when reading these names, but if you peel off the first, obvious layer, you have to admit that these ‘cheesy’ mixes actually do work. Mixing 45 songs together in one hour of music is one thing. But making that hour a consistent exploration of the history of pop music is quite another. ‘2 Many DJ’s’ makes you laugh, yes indeed, but it also covers left, right, top and bottom of groovy pop. Some of the tracks on this album are obvious classics, some are simply unknown and some will very soon become hot sought-after gems. From Japanese geisha Hanayo covering ‘Joe le Taxi’, 21st century proof electro from Adult., Finnish disco from Ural 13 Diktators or sleazy Peaches to classics from The Velvet Underground, The Breeders, The Residents, Sly And The Family Stone and Nena. They’re all there for a reason. ‘2 Many DJ’s’ proves that ‘genre’ has never been such a naff word.